ESPN has taken the new Golic and Wingo morning radio/TV simulcast show on the road once again, this week to the NFL Draft in Arlington, TX. Building on the show’s first road trip — to Minneapolis in February for Super Bowl LII — ESPN has again opted to use Azzurro Group’s Pop Up Studio product to create a scaled-down production that doesn’t skimp on quality. 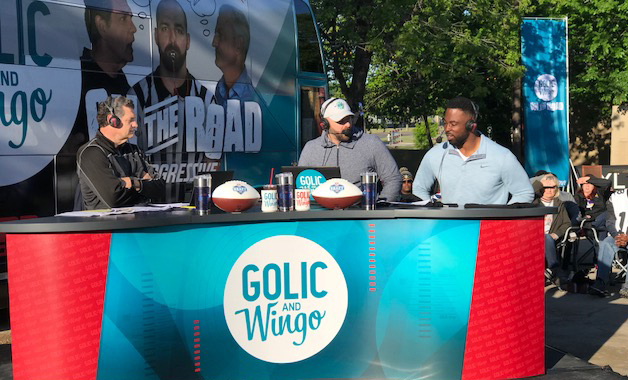 ESPN is looking to create a tailgate-like vibe, opening the broadcasts to the public and rolling out the “Golic and Wingo” traveling bus at the NFL Draft. Golic and Wingo — hosted by Mike Golic and Trey Wingo, with Mike Golic Jr. — is broadcasting live Thursday and Friday from the 1010 Collins Events Center, just down the street from AT&T Stadium. 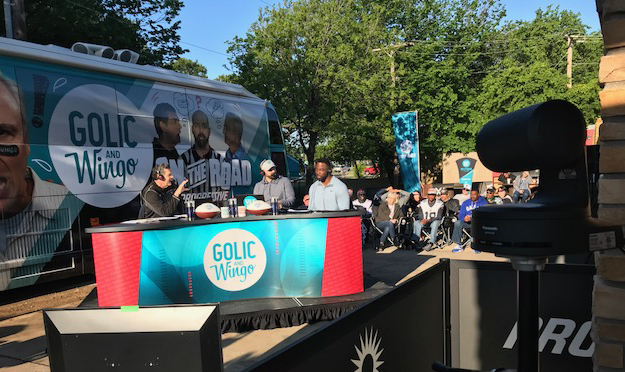 ESPN is looking to create a tailgate-like vibe, opening the broadcasts to the public and rolling out the Golic and Wingo bus, which will be on display during the shows. ESPN is discretely transmitting three PTZ cameras onsite at the set to Bristol via public internet in producing “Golic and Wingo” at the NFL Draft. 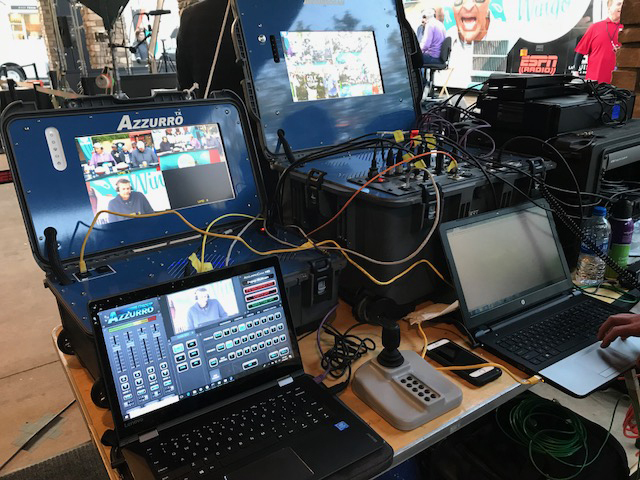 Azzurro’s Pop Up Studio essentially serves a “truck in a suitcase” solution that allows ESPN to produce the entire show without having to roll up a production truck. ESPN is discretely transmitting the three PTZ cameras onsite at the set to Bristol via public internet. The cameras are all controlled and shaded in Bristol, where the show is integrated. ESPN is using Azzurro Group’s Pop Up Studio to produce “Golic and Wingo” live from the NFL Draft in Arlington, TX. The only crew members onsite are an operations producer, a radio engineer to mix the audio (for both radio and TV), two lighting coordinators, two utilities to set up the cameras, a remote traffic director coordinating the feeds, and an Azzurro technician.